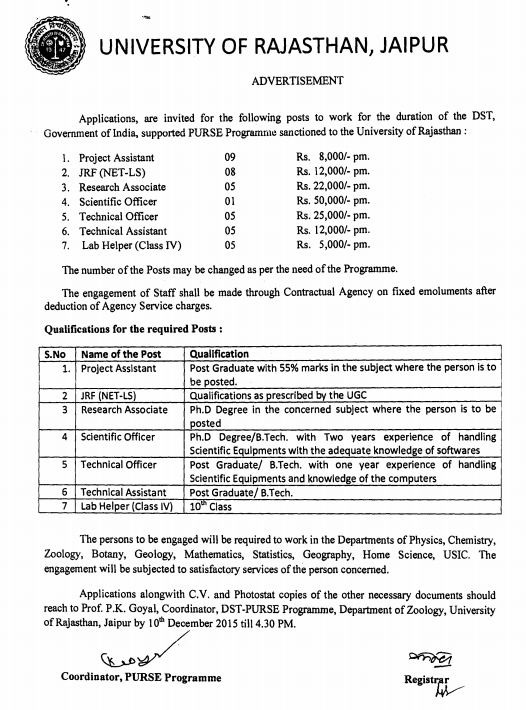 The Jaipur Rajasthan University invite applications for the recruitment of Project Assistant, Junior Research Fellow (JRF), Research Associate, Scientific Officer, Technical Officer, Technical Assistant and Lab Helper (Class IV) posts. Interested candidates may apply for the said posts on or before 10.12.2015 till 4:30 PM. 7. Lab Helper (Class IV)- Matric qualified. The keen and interested candidates must send their application with Bio-date/CV and photocopies of required documents to the Prof. P.K. Goyal, Coordinator, DST-PURSE Programme, Department of Zoology, University of Rajasthan, Jaipur. The last date for receipt of application form is 10.12.2015 till 4.30 PM.